There are a vast amount of reasons to love the Mazda6. It offers drivers high-end styling at an approachable price, an efficient and straightforward drive, and a huge menu of standard and available features. This model is a sound choice in its midsize sedan section of the market. For the 2018 model year, it's been updated in a number of ways. The team here at Bert Ogden Edinburg Mazda wants you to be fully informed about your next vehicle purchase, so we put together this comparison of the 2018 Mazda6 vs the 2018 Toyota Camry. Let's see how they stack up! With a base MSRP of $21,950, the 2018 Mazda6 comes in at a more affordable price point. That's compared to $23,495 for the 2018 Camry. Even though the Mazda6 has a lower MSRP, it offers a wider menu of standard features than the Toyota Camry does. Features include the MAZDA CONNECT™ infotainment system, Dual-zone Climate Control, Rear Cross Traffic Alert, Blind Spot Monitoring, and so much more.Keep reading below for more details. 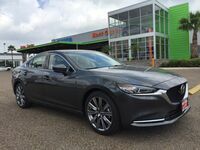 When comparing standard feature sets in the midsize sedan segments, it's hard to beat all that Mazda can offer at such an affordable price point. When you take a look at available engine options, too, this is hard to beat. Drivers love the 2018 Mazda6's available turbocharged 2.5-liter four-cylinder SKYACTIV®-G engine. This engine makes easy work of producing 250 horsepower and 310 lb-ft of torque. The 2018 Camry has no available turbocharged engine option in this year's lineup. Performance is taken to the next level for the 2018 Mazda6 with Standard G-Vectoring Control system across all models This helps improve handling and overall consistent engine output. Check out the 2018 Mazda6 at Bert Ogden Edinburg Mazda today!